No log-in privileges but appears in the calendar and applicable lists. 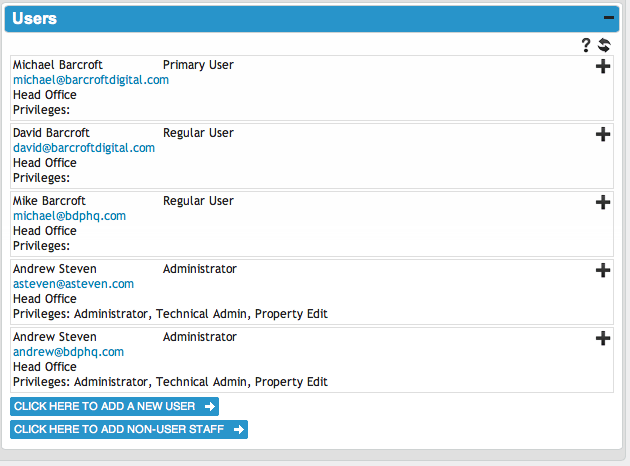 Administrators have access to all areas of your BDP account including adding and removing properties, applicants, other system users and all areas of account configuration. We advise restricting Administrator privileges to a few trusted individuals in your organisation. You will likely want to grant access to BDP to your web developer or in-house technical team, however you probably don’t want them gaining access to your applicant or property database for confidentiality reasons. Technical administration rights grant the user full access to the configuration settings of your account, including the ability to upload custom templates, email templates, set business rules, etc. This is the setting for your property team who use the system from day to day. It allows access to the full set of property and applicant management tools, but not to any of the configuration settings. Individuals who are marked as valuers will appear in the Valuer drop-down box in the property details page, Management widget. If you wish to grant access to a conveyancing solicitor they can see all activity related to a property, but they can’t edit or otherwise change the record. This is a view-only privilege. You often need to use the names and other details of staff members in email communication, documents, etc., however they aren’t required to use BDP. Independent viewing agents often fall into this category. Non-user staff will not receive a confirmation email when added to the system and are available immediately. NOTE: After you have added a new user, return to their record and edit to ensure that the correct details, roles and privileges are recorded as required. Not all parameters are available when initially adding a new user record.